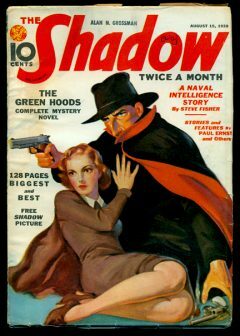 The Shadow novel in this issue, “The Green Hoods,” was one of three optioned by Columbia Pictures in 1939 when they licensed screen rights to the character for a 1940 serial starring Victor Jory. Although Columbia’s writers ultimately came up with their own plot, some elements of “Green Hood” did make it into the film. This issue also features one of Steve Fisher’s Sheridan Doome stories, bylined to Fisher on the cover but inside to Stephen Gould, one of his pen names. Condition: About Fine. Clean, tight, complete bright spine, lightly yellowed but supple text block. This copy belonged to well-known hero-pulp collector Al Grossman, and bears his distinctive name-stap on the front cover above the logo.